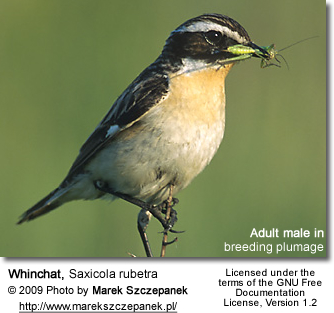 The Whinchat, Saxicola rubetra, is a small passerine bird that was formerly classed as a member of the thrush family Turdidae, but is now more generally considered to be an Old World flycatcher, Muscicapidae. It, and similar small European species, are often called chats. Its scientific name means "reddish rock-dweller", in reference to its habitat and overall coloration. 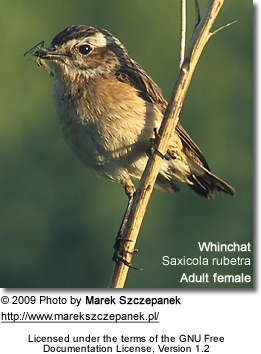 Saxicola derives from Latin saxum ("rock") + incola ("inhabitant", "one who dwells in a certain place"). rubetra is Latin for "colored reddish" or "reddish-hued". It is is a migratory insectivorous species breeding in open rough pasture or similar uncultivated grass- or shrubland in Europe east to the Ural Mountains approximately. Bracken (Pteridium) stands on rock-strewn ground are also a favorite habitat of this species. It nests in tussocks. The birds like to perch on elevated spots such as telephone wires, from where they make sallies to catch flying insects. They winter in norther sub-Saharan Africa; they arrive in Western Africa at the start of the dry season. Molt of the remiges (flight feathers - typically only visible in flight) does not usually take place in winter quarters, but young birds may replace their first set of remiges (flight feathers - typically only visible in flight) before their first migration back to the breeding grounds. 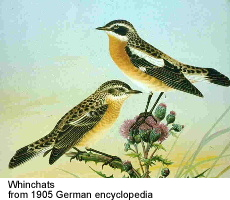 The Whinchat is similar in size to the European Robin. Both sexes have a yellowish rump and white tail, with a black terminal band. The summer male has brownish upperparts, buff throat and blackish head sides. It has a strong white supercilium. There are white wing patches. The female has pale brown head sides, a buff supercilium and no white wing patches. The male has a whistling, crackly song. Its call is a typical chat “chack” noise or a soft whistle.